A friendly reminder for all dog owners to please clean up after your pets! 1. East Lake: Fully fenced-in area designed for small dogs (under 30lbs ONLY). Parking is available on the west side of the enclosed area. 2. Big Springs: Partially fenced in area located on the pathway south of the cemetery to Spring Haven Crescent. This area is fenced between the QEII Highway and runs along the backyard residential area. 3. 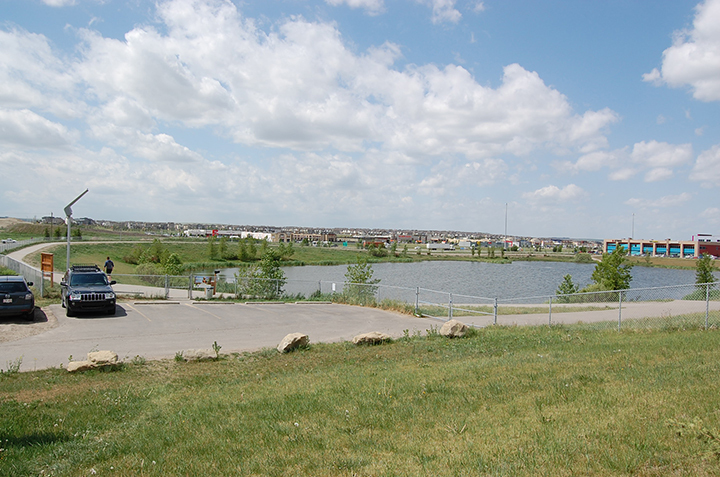 King's Heights: (Pictured above): Fully fenced-in area with a body of water accessible to animals located at Sharp Hill Way and Kings View Road. 4. Edmonton Trail: Partially fenced-in area located on the pathway south of third avenue to Sandstone Crescent between the residential area and QEII. Please Note: The Nose Creek off-leash area may periodically be used as an overflow parking area when large events are being held in Nose Creek Park. These events may include, the Festival of Lights, the annual Show & Shine and any other large function which may be supported by the City. Pet owners are responsible for cleaning up after their pets. Please ensure that pets are in control at all times - on or off of a leash. All sessions are held from 9 - 11 a.m. at The Place 4 Paws. For more information, please call 403.948.8892 or email municipal.enforcement@airdrie.ca.